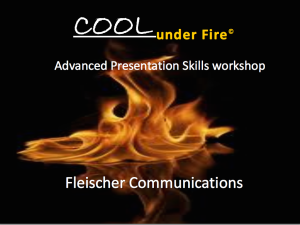 This is the web site of Fleischer Communications, owned by Marianne Fleischer. For each visitor to our Web page, our Web server automatically recognizes no information regarding the domain or e-mail address. Visitors must manually complete our Contact form for us to retrieve your email address or other contact information. With respect to 3rd party lists: We never sell your data to 3rd parties for any reason. With respect to email addresses: We use email addresses for internal record keeping, occasional surveying of our readers to better understand our market, and other communication informing our readers of our services, events, and future products. If you do not want to receive e-mail from us in the future, please let us know by sending us e-mail at the above address, calling us at the above telephone number, or writing to us at the above address. With respect to postal addresses: If you supply us with your postal address on-line you may receive periodic mailings from us with information on new services or upcoming workshop events. If you do not wish to receive such mailings, please let us know by calling us at the number provided above, e-mailing us at the above address, or writing to us at the above address. With respect to telephone numbers: Persons who supply us with their telephone numbers on-line will only receive telephone contact from us with information regarding orders they have placed on-line, programs they have expressed interest in, or as follow up to live or virtual training. Persons who supply us with their telephone numbers on-line may also receive telephone contact from us with information regarding new consulting services or upcoming workshop events. If you do not wish to receive such telephone calls, please let us know by sending us e-mail at the above address, calling us at the above telephone number, writing to us at the above address. Customers may prevent their information from being used for purposes other than those for which it was originally collected by e-mailing us at the above address or writing us at the above address. With respect to security: When we transfer and receive certain types of sensitive information such as financial information, we do so through a secure server. We have appropriate security measures in place in our physical facilities to protect against the loss, misuse or alteration of information that we have collected from you at our site.